shoebox Archives - Are We Zen Yet? Food, laughs and crafts with our beautifully crazy family. 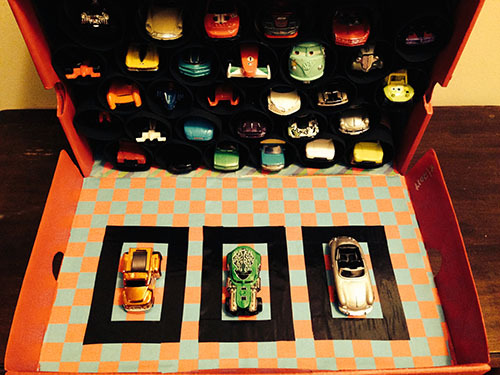 No doubt Kidday loves his cars as much as his trains, and when I came across this Shoe Box Toy Car Garage on Pinterest, I was inspired. I knew I wanted to make some modifications, though. Specifically, I wanted the garage to be mobile and easily put away because frankly, I’m a neat freak. I decided to turn the lid of the shoebox into the car garage floor where the cars could be serviced. Once play time was over, the cars could be placed into their toilet paper roll parking spots, the box turned right side up with the cars now laying on the bottom of the box, and the lid closed making it easy to move from room to room or take on trips. If I were to do this again for Kidbe, who seems to be a car-lover in the making just like her big brother, I would cut the toilet paper rolls down a bit because they’re deep as-is and when the cars roll all the way to the back of the box, they’re hard to get out. It was a bit frustrating for me that they moved to the back so much, and certainly we like to avoid child meltdowns if at all possible. The supplies listed below are what I used and would vary depending on how elaborate you want to be. 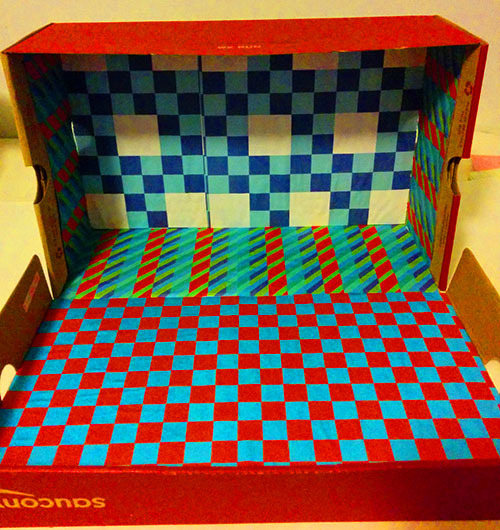 The first thing I did was line the box with some decorative paper and Elmer’s glue. I kind of went all out and even lined the back wall that would be covered by the toilet paper rolls because fancy! This will be where your precision knife comes in handy, taking care of edges and sides under where the box has flaps. After the glue dried, I used black electrical tape to outline three rectangles which would serve as service spots. I also painted the box to cover up branding and labels as well as to make the color uniform. 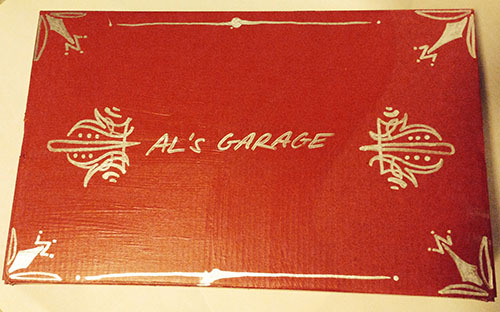 Then, I took a paint pen and tried my hand at some faux pinstriping and garage sign paintbrush lettering. Assembling the car spots is pretty easy, just stagger and layer them. For the first row, leave some space (an inch or so) from the sides/walls before you glue down the first and last rolls. From the second row on, glue rolls so they’re resting in the middle space of two rolls underneath them or one roll and a side wall. Kidday was pretty excited to see this little surprise I’d been hyping up for a couple weeks. He was so excited, in fact, he played with it for all of fifteen minutes… and then didn’t play with it again for a couple of days until I gave him a friendly reminder of its existence. He plays with it regularly now, and this shoe box toy car garage is really worth the time and effort. Copyright © 2019 · Are We Zen Yet?